Here is an excerpt of Lola's story. I've been working on it all week. Today is the anniversary of her birth, 83 years ago. And though she never got her apology, I know she wants one still. Not so much for herself, but for the future of all girls and women and children who live in a constant state of war. She wants that apology to heal the tired souls of victims and soldiers alike. Happy Birthday, Lola Iyak-Iyak! Mahal na Mahal kita! Out on the balcony she talks fast and when all I do is listen, she tugs on my arm and points at my camera. The Dalaga Project have only been in Manila a week and we are just getting to know the women. Since some of the girls are fluent in Tagalog, some only passive in their understanding and others English only speakers, we thought it would best not to conduct formal interviews, but to find activities like dancing and painting and drama to help us learn about their lives and their stories. Formal interviews are so cold and intrusive. We have made a choice not to conduct them at all, but here we stand in the beautiful afternoon light of Lola Cristeta’s cement balcony, surrounded by palm trees and ferns, and other lush greenery, on the verge of just that. She insists I turn on my camera. I obey. I flip the screen open and nudge the switch. The light flashes green and the mini monitor lights up blue and then softly, her face emerges in the tiny screen. I hit the record button red. I pull back and she begins in a calm way. 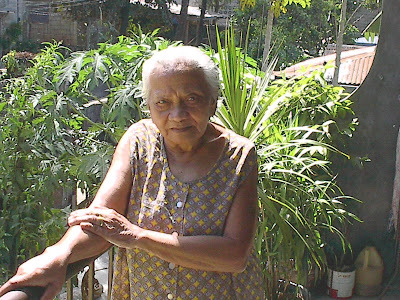 She gives her testimony slowly and in Tagalog, calling out her birth date – July 26, 1926 – and her hometown, Barrio Cogon, San Jose, Tacloban City, Leyte. She tells us about her mother, the laundry woman, and her father, a womanizer with many mistresses from Leyte to Manila. She names her sister, her two brothers and she tells us she was the ate. The camera zooms in tight on her face because the sunlight is so golden, revealing all the lines on her beautiful brown skin, sometimes drifting to her silver white hair tucked behind a thick earlobe. The voice is soft and rough like a dirt road scattered with fine pebbles. Her words float out of her slowly. I hold the camera with my hand and I watch her, not the viewfinder. I watch the light in her eye, how it dances as she speaks. How relief washes over her entire body. She smiles as she talks. Her arms wrap around herself – the right arm reaching up across her chest to the left shoulder and the other cinched around her waist. Now and then the hand on her shoulder goes up to gesture at the camera. One day, when she was sixteen years old, she and her 14 year old brother Marianito, were sent to the market in town on an errand and when they returned to the barrio around three in the afternoon, the small village was empty. No one walked the pathways, no one stood in the center of the town. Someone told them that the Japanese soldiers had come while they were gone and that everyone who had not gone into hiding was taken to the Japanese garrison set up in San Jose, Leyte. As Lola Cristeta speaks to us, her breath goes short. Her words falter and then suddenly she’s speaking quickly, no longer in Tagalog, the language we speak, but Visayan. Maribel does her best to interpret Lola’s dialect, but only because she knows Lola’s testimony. We step closer to her, the camera shooting her mouth, her eye, the inside of her ear. We are with her. We become her. Eliza and I exchange glances and we see that we too have tears streaming down our faces. And this is where we lose her. The deeper she goes into her experience, the farther away she seems, lost somewhere on the island of Leyte, in the center of its green wilderness. She hiccups, she tears. The words tilt left and right. Grow harder to decipher. She paws at her collarbone and winces. Slips back and forth between Tagalog and Visayan and even as we cannot understand her, we find ourselves slipping into the past, feeling the weight of the experience. We enter the small house in Cogon only to find the Japanese soldiers waiting for us, swooping down on us, dragging us down the road. It is in her eyes. It is in the lapses of her breath. Eliza and I, like the brother and sister are torn apart, one made to turn left and the other forced right and the heart raw like meat ripped in two. The tears wash Lola Cristeta’s face and the breathing grows shallow, but she does not stop talking. We are at the airstrip by the water. She keeps talking. We are in a pit of sand dug for fish. We are thirty girls thrown together, like catches of the day, imprisoned by barbed wire walls and bamboo locked doors. She talks over her own crying now. Faster and louder and now she is going into Waray, a native dialect, a language so deep and so intense that it must be coming from her very core. On this day, she tells me everything, mixing all her words together like a giant batch of alphabet soup, the Waray and Tagalog and Visayan, the occasional English word tossed in for flavor, all holding their shape, translating her two years in that fish bin, drowning with thirty other girls. She tells me all I need to know, though I understand nothing but the tears rolling down my own face. I am currently working on visual pieces based on the stories of "comfort women"
This is heartbreaking and mindspinning. An absolutely necessary piece of our history that needs to be better understood and heard. Thank you for this project. I'll be meeting with you at VONA, perhaps afterward we can talk about our projects. Looking forward to meeting you at VONA. Thanks for your post and your work on behalf of the lolas -- I know they appreciate your efforts.